We've made Journey free for everyone to use - no strings attached. Create and field as many surveys as you want! Journey is user-supported; click here to make a donation. Online surveys the way they should be: simple, flexible, and hassle-free. 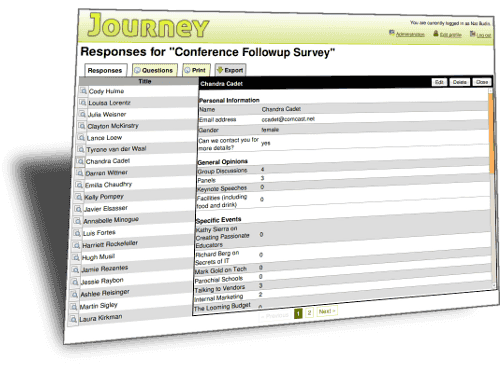 Whether it's market research, feedback questionnaires, or online polls, Journey lets you get answers. Design a survey, watch the responses in realtime, analyze your answers, and download the results into a spreadsheet. It's that simple.